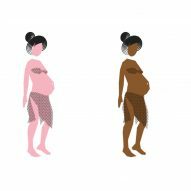 Italian designers Francesca Perani and Claudia Manenti have illustrated 488 scale figures that they are offering for use in architectural drawings, featuring characters of different ages, skin tones and gender identities. Called Cutout Mix, the project is a response to the "growing need for more emotional diverse cutouts populating design renders". The designers have so far created two packages, titled Calendar and Archifunky, which are available to download for free. 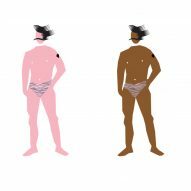 Both packages feature an assortment of minimalist graphic characters of varying genders and skin tones. The illustrations were originally created as part of a Christmas calendar for family and friends in architectural practices. The first package, Calendar, includes 12 female silhouettes and 20 male cutouts in a range of poses. "Architecture is going through a very intense post-digital drawing revolution moving away from photorealistic renders and embracing more visionary visual narratives," said Pereni. "The main idea behind the collection was blending photography and illustration to generate a new interpretation of cutouts," she told Dezeen. The second package is called Archifunky. It features two-dimensional illustrative figures, from a pregnant woman to a person in a wheelchair. "This collection is unique in being openly against trite stereotyped characters while offering broader and more realistic silhouettes reflecting contemporary life," said Perani. "It also embraces a peaceful, diverse and inclusive vision of the designed future. Skin colour, different ability and a wider gender spectrum are central to this set," she explained. The project is meant as a response to the difficulty architects face when searching for images of people to use in digital renders. Perani believes this often leads to people borrowing from silhouettes in paintings or photographs and infringing copyright rules. "Way too often though, the characters populating project renderings are borrowed from well-known works of art with no regard for copyrights," she explained. Elsewhere, British studio Those designed a connected whiteboard that uses a robot arm to draw everything from illustrations to shopping lists, while artist Dan Hogman's ink sketches depict buildings and streetscapes.